Danger: Passing plain text tokens in public projects is a security issue. Potential attackers can impersonate the user that exposed their trigger token publicly in their .gitlab-ci.yml file. Use variables to protect trigger tokens. You can use the CI_JOB_TOKEN variable (used to authenticate with the GitLab Container Registry) in the following cases. Note: The use of CI_JOB_TOKEN for multi-project pipelines was introduced in GitLab Premium 9.3. Pipelines triggered that way also expose a special variable: CI_PIPELINE_SOURCE=pipeline. Read more about the pipelines trigger API. - curl --location --output artifacts.zip "https://gitlab.example.com/api/v4/projects/1/jobs/artifacts/master/download?job=test&job_token=$CI_JOB_TOKEN"
This allows you to use that for multi-project pipelines and download artifacts from any project to which you have access as this follows the same principles with the permission model. Read more about the jobs API. 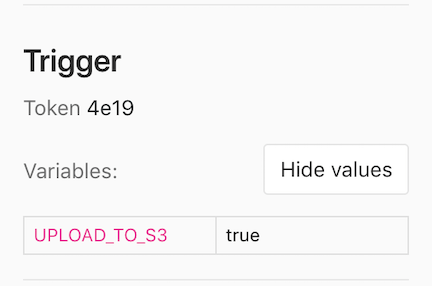 You can add a new trigger by going to your project’s Settings ➔ CI/CD under Triggers. The Add trigger button will create a new token which you can then use to trigger a rerun of this particular project’s pipeline. You can revoke a trigger any time by going at your project’s Settings ➔ CI/CD under Triggers and hitting the Revoke button. The action is irreversible. The required parameters are the trigger’s token and the Git ref on which the trigger will be performed. Valid refs are the branch and the tag. The :id of a project can be found by querying the API or by visiting the CI/CD settings page which provides self-explanatory examples. When a rerun of a pipeline is triggered, the information is exposed in GitLab’s UI under the Jobs page and the jobs are marked as triggered ‘by API’. You can see which trigger caused the rebuild by visiting the single job page. A part of the trigger’s token is exposed in the UI as you can see from the image below. Note: The following behavior can also be achieved through GitLab’s UI with pipeline schedules.